Last January I had the honor of being accepted as a Google For Education Certified Trainer, this was the result of a long journey, one that had started more than 4 years ago when I discovered the benefits of Google Apps for Education (as they were called then). What motivated me back then was how easy it was to apply a great variety of teaching strategies with these tools. During those years I tinkered and discovered many great things which I shared with many of my coworkers, and on various social networks. I had considered applying for the trainer program on multiple occasions, but always felt I still didn't have a good enough portfolio to make the cut. Last december I finally bit the bullet and submitted my application. I had just come back from the #Mex16 Google Innovator Academy and felt ready to take on any challenge. I was extremely happy when I got the news, for some reason I thought that I would now start training a lot of people. Well it turns out that not many people were interested in my services, I got some calls and email through the Google for Education Directory, but nothing more than that. I offered my services for free at different places, but there really was no interest. To maintain my trainer status I have to conduct 12 training sessions per year and with this little demand it was not going to be easy. 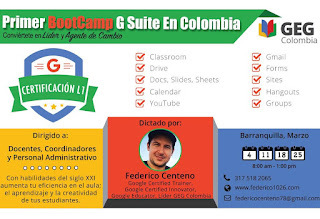 So by mid February I guess I must have heard a voice overnight saying “If you build it, they will come.” I woke up and decided I would just set up my very own G Suite Bootcamp, The 1st G Suite Bootcamp in Colombia. I felt like this was crazy, but I knew that if I kept waiting I would end up doing nothing at all so I decided to go for it. There was one thing I knew, and it was that I wanted the people that attended to feel that this was not their usual PD, this was special. That day I started thinking on the logistics, I needed a good place to hold the event, I wanted to offer some sort of snack, and it had to be fun. That day as I designed a flyer on Photoshop I was also making calls to find a place to rent. I ended up renting a conference room that could hold up to 14 people, it included a huge TV, and they also provided the snacks and unlimited water, coffee and tea. I started sharing the idea with others, and my wife also a teacher, started telling her friends that the G Suite Bootcamp was coming. The next day I posted my flyer on Google+, Linkedin, Facebook, Twitter, and Instagram and put pressure on me on getting this done. I got a lot of great feedback from people on these social networks, but in reality very few people submitted the form expressing interest in the 1st G Suite Bootcamp in Colombia. I must admit that I was a bit worried, but I decided that I was going to follow through with it even if only one person enrolled. I worked on the course materials and bought some Google Goodies to hand out as gifts. A week before starting I had 12 people out of 14 confirmed, just with a verbal agreement (I’m still worried about the money this will cost me). The day before starting five people called and cancelled. Later 2 more called telling me they couldn’t make it on the first Saturday but that they could come on the other days. I told them that the course materials would be available online so they could catch up and it wouldn't be a problem if they missed a day. Throughout this experience I noticed that this is really all about passion. If you are passionate about something it doesn't really matter what you have to do or face, you will get through it. I am wondering how many people will be enrolling in the second Bootcamp, but something tells me it will be more than this one. I learned a lot from this experience and I am sure that the second time around it will be much better.